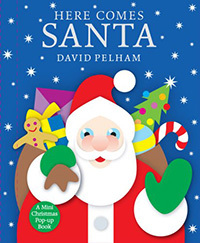 Whether you are looking for books for your Christmas book advent calendar or simply a story to share over the holidays with the children in your home or classroom, this great big list of Christmas picture books featuring the jolly man in red is sure to delight! But don’t just stop here! 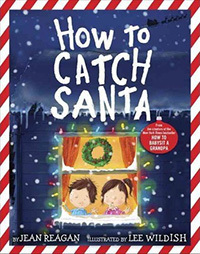 Be sure to also check out our collection of 12 Funny Christmas Books for Kids, plus Books Celebrating Christmas Around the World and our list of Best Christmas Books for Tweens. 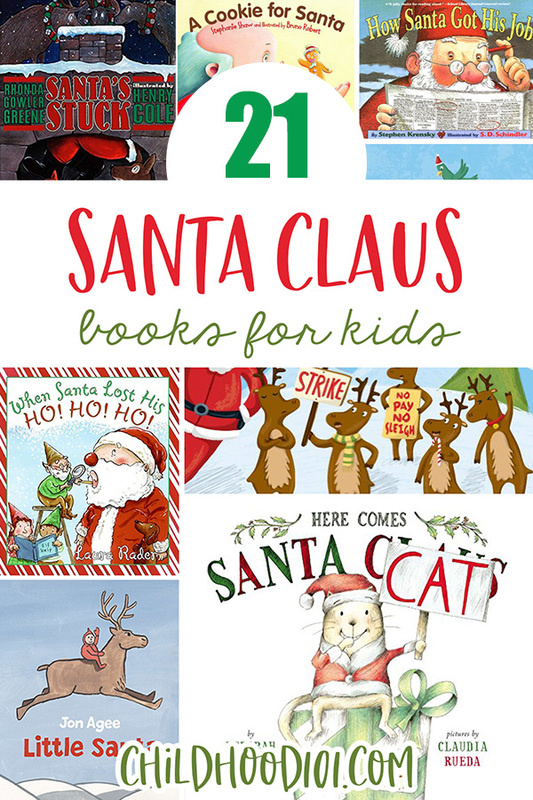 21 Christmas Picture Books Starring Santa! Each title below is linked to Amazon and The Book Depository (these are affiliate links). 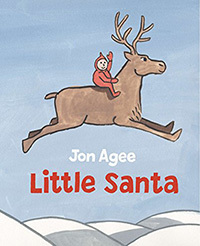 A delightful Christmas world of mini pop-ups hides between the covers of this sweet Christmas rhyme. Join Santa and his reindeer as they make Christmas wishes come true. 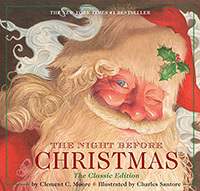 A wonderful version of the classic poem, beautifully illustrated by Charles Santore. Sure to become a family favourite. 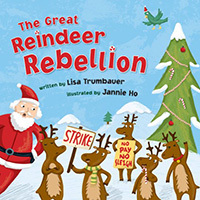 There’s trouble brewing in the North Pole: Santa’s reindeer have gone on strike and he’s auditioning other animals to take their place. But when the cats abandon station to chase some mice and the elephants fall through the roof, what’s Santa to do? It’s time for Holly to make her Christmas list, but she has a few questions for Santa Claus first. So she decides to write notes to Santa instead and is amazed when he replies — five times! 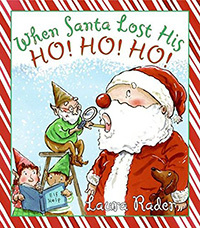 Along with fun removable letters, readers will discover an advent calendar, a Santa ornament, a foldout reindeer guide and one last, special treasure. Papa Bear, Mama Bear, and Baby Bear weren’t expecting company when they went for a walk on Christmas Eve, but that’s exactly what they got! 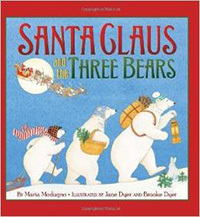 A festive twist on Goldilocks and the Three Bears, with Santa Claus stepping in as the cheerful intruder. Little Santa loves the North Pole. The rest of his family? Not so much. So, when they decide to move to Florida, Santa is miserable. Lucky for him, a blizzard foils their plans! 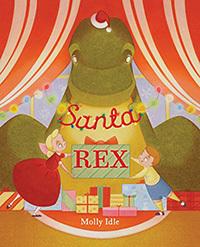 Christmas has arrived and nothing says holiday cheer quite like candy canes, hot cocoa, and DINOSAURS! Will Santa Rex bring Cordelia everything she asked for? It’s almost Christmas, and everyone is getting ready for the big day. But there’s something wrong at the North Pole. It’s just a bit too quiet. Oh no! Santa has lost his laugh! Santa has a problem. 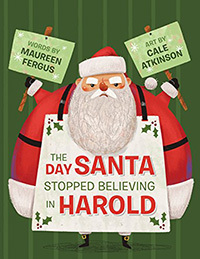 This kid, Harold – Santa doesn’t think he’s real. 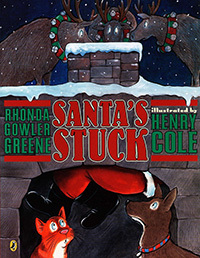 Santa comes up with a plan to find out once and for all if Harold really exists with hilarious consequences. 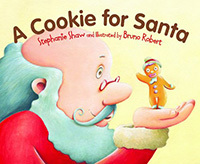 In this clever twist on the Night Before Christmas, a gingerbread boy cookie is made specially as Santa’s nighttime snack. The cookie wonders if he is brave enough to face up to his holiday duty. But instead of spending the evening contemplating his fate, the gingerbread boy finds himself facing two mischievous puppies experiencing their very first Christmas. It’s up to the gingerbread boy to save the day…and Christmas! 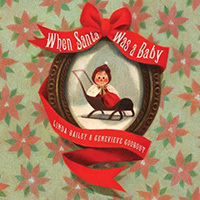 This playful picture book answers the age-old question: Just how does Santa shimmy up and down chimneys? Not very easily sometimes! When the rotund fellow with a sweet tooth overdoes it on the snacks, he gets stuck inside a chimney. It takes a tiny, ingenious mouse to come up with the way to pop Santa out so that Christmas can go on! Santa’s parents think their little one is absolutely wonderful even though he has a booming voice, loves to stand in front of the refrigerator, gives his birthday presents away and has an unusual interest in chimneys! When Santa was young and needed a job no one was looking for a man in a red suit to deliver gifts on Christmas. 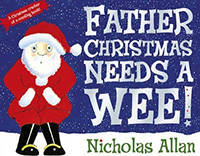 So Santa tried just about everything – from a chimney sweep to a postman to a circus performer. But none of these worked out. It wasn’t until he met a group of elves that he found his dream job. 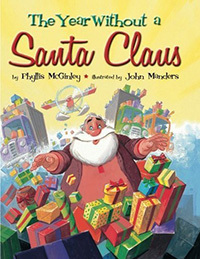 Find out where Santa’s rosy cheeks and big belly really come from in this funny, festive and silly look at Santa’s biggest secrets. Christmas is coming and Cat has a hunch he’s not on Santa’s ‘nice’ list. Does this mean no presents for Cat? So he tries to be good, and he might just surprise himself. 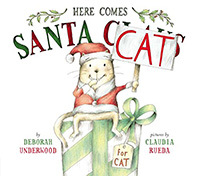 Best of all, Cat may just get to meet the man in the red suit himself—and receive a holiday surprise of his own. It’s Christmas Eve and Santa is busy getting ready for the big night. 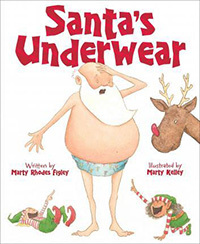 But when he goes to put on his warm, cozy (holey, ragged) Christmas underwear, they’re nowhere to be found! With undies for every occasion, he tries on the rest of his collection. But nothing is quite right! Don’t you have a zillion questions to ask Santa? So you need a plan to catch him! Remember: be crafty! Be clever! Be gentle! Clever tips for capturing Santa when he visits on Christmas Eve. 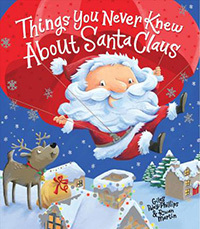 A fun counting book exploring all of the delicious food and drinks Father Christmas enjoys as he visits each house on Christmas Eve. But what happens when Santa drinks too much?! 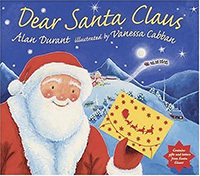 No-one needs a holiday more than Father Christmas, but where can such a well-known and easily recognized person go? 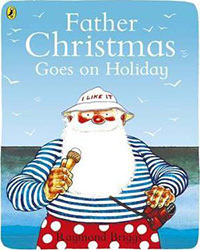 Father Christmas sets off in search of his ideal holiday spot! France, Scotland, Las Vegas? Where will he settle? Santa has woken up on the wrong side of the bed. He’s got a crick in his neck, a cold in his nose, and aches in his fingers and all ten toes. So Santa decides to take his first vacation in one thousand years. 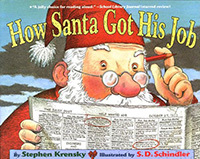 The Elves, the reindeer and, most of all, the children around the world are upset when they find out. But then a small boy comes to Santa’s rescue, and children everywhere band together to give Santa a Christmas he’ll never forget! For a little girl named Susan, Christmas could be any other day. She doesn’t believe in Santa Claus or magic or miracles of any kind. Then one day she meets Kris Kringle and finds herself hoping that just maybe, he is the real thing. 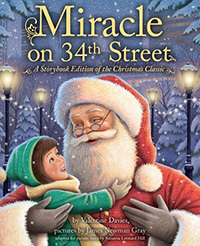 Based on the original holiday classic, Miracle on 34th Street is a heartwarming story about generosity, imagination, and the spirit of Christmas. Be sure to check out entire best book for kids catalogue! It’s jam packed with themed book suggestions for kids of all ages.